Photo shows MNPV6 with either breakers or fuses. Includes 15 position PV negative bus bar, 14 position ground bus bar, 120 amp Plus bus bar for breakers and 80 amp bus bar for fuses. (For 150 VDC charge controllers and 600 VDC grid tie inverters) (The most popular PV combiner in North America.) 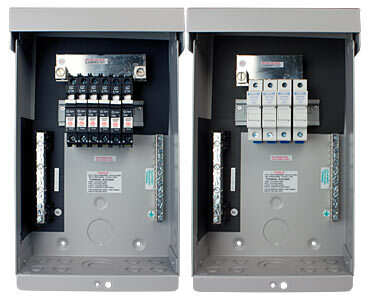 Gray aluminum type 3R rainproof enclosure with insulating dead front, will accept six 150VDC breakers or 4 touch-safe fuse holders.